Del Mar Screens proudly offers Pride Pet Doors, the less expensive, longer lasting, heavy duty extruded aluminum pet door for sliding glass or screen doors. Allows private entry and exit for your dogs or cats, so you can relax! 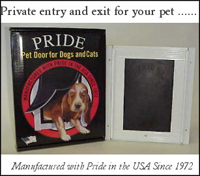 Most pets can be taught to use your new Pride Pet Doors in minutes. Versatile: adapts easily to fit doors, walls or dog houses. Finishes: standard satin-finish anodized aluminum or bronze, tan, white or black. Safe: tough, long-life flexible dual-action rubber panel. Stays Closed: imbedded magnets keep door closed to prevent drafts, dust and insects. Deluxe models have drop in security panel. 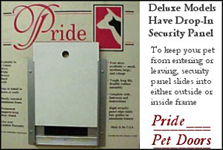 To keep your pet from entering or leaving, security panel slides into either the outside or inside of frame. 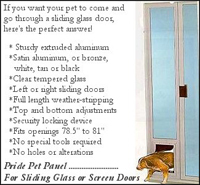 Pet Pride Doors come in small, medium, large and extra large to meet your specific pet needs. Give your pet a private entry and exit! Sizes accommodate small cats to large dogs. Let us install one for you today. Just give us a call at: cell: 760-420-0559. Mobile screen repair. Patio door, sliding door, retractable window screens and pet doors and grills repaired, replaced and installed. Patio door roller and track repair and replacement. Del Mar Screens serving all of the North County area in San Diego, CA. We service all of North County San Diego, which includes the communities of Del Mar, Rancho Santa Fe, Carmel Valley, Vista, Encinitas, Cardiff, Leucadia, Carlsbad, San Marcos, and Oceanside.